“I’d rather be heard than comforted,” Nancy Smoyer writes near the end of Donut Dollies in Vietnam: Baby-Blue Dresses & OD Green (Chopper Books, 250 pp., $15.00, paper). By that point in the book, Smoyer has fulfilled that goal in this memoir that looks at her time in South Vietnam during the war and its aftermath. Smoyer was one of 627 women in the Red Cross Supplemental Recreation Activities Overseas program, which lasted from 1965-72. The largest number of women in-country at one time, she tells us, was 109 in 1969. All of them were college grads and volunteers. They inherited the nickname “Donut Dollies” from Red Cross workers who performed similar duties in Europe during World War II. Being in-country and exposed to the same threats as the men in uniform, Donut Dollies encountered common war and post-war problems. After coming home Smoyer suffered PTSD, predicated on survival guilt, which was compounded by her brother’s death in action a few months after she returned to the United States. On a visit to Vietnam in 1993, Smoyer says she overcame her PTSD by learning compassion for the Vietnamese—something that she had not allowed herself to feel before. Over the years, Smoyer extended her volunteer work to many other areas dealing with veterans. Serving in Vietnam gave her life its ultimate purpose. She closes the book with letters in tribute to her brother—a Marine lieutenant—from his teachers, coaches, and friends. While telling her story, Smoyer makes references to the experiences of many other former Donut Dollies. She has maintained contact with them through email, letters, tapes, reunions, musings, and conversations. Like Nancy Smoyer, they have a lasting commitment to helping veterans. Smoyer is donating proceeds from the sale of her books to the Semper Fi Fund. Fallen: Never Forgotten: Vietnam Memorials in the USA (RU Airborne, 268 pp., $34.95) is a large-format book put together by Ronny Ymbras, Matt Ymbras, and Eric Rovelto that devotes one chapter to a Vietnam veterans memorial in each state. “We sought to choose the state memorial, a memorial closer to people’s hearts, or a new memorial,” Ronny Ymbras, who served with the 101st Airborne Division in the Vietnam War, writes in the book’s Foreword. Each state’s page contains photos of a memorial or monument, along with a brief history, and an alphabetical listing of the names of those from that state who died in the Vietnam War. The authors include iconic state memorials such as the unique and powerful Kentucky Vietnam Veterans Memorial in Frankfort, which contains a sundial that places a shadow on the name of each that state’s Vietnam War KIA on the anniversary of the death. There’s also the eight-acre Vietnam Veterans Memorial of Oregon, also known as the “Garden of Solace,” located in an arboretum in Portland, which includes a 1,200-foot walking path surrounded by pine trees. Not to mention the iconic Angel Fire memorial in Northern New Mexico and the New Jersey Vietnam Veterans Memorial and its Vietnam Era Museum & Educational Center in Holmdel. There also are lesser-known memorials, including the Vietnam Veterans Memorial in Lasdon Park in Westchester County, New York. Using that memorial in the book, Ronny Ymbras says, “is personal for me. I was there for its dedication, carried the 101st chapter flag in the parade and honored three guys I went to school and played ball with. May they rest in peace, Pete Mitchell, Peter Bushey, and Jeff Dodge. Altogether, this coffee-table book is a top-quality tribute to American service personnel –living and dead—who served in the Vietnam War. 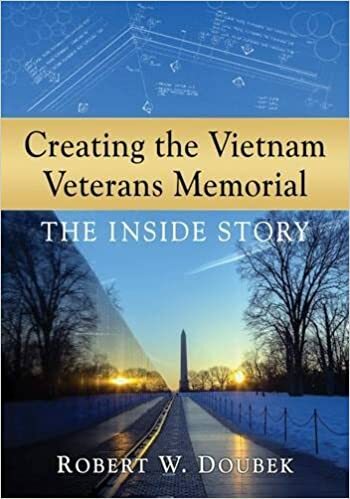 Robert W. Doubek says he is “blessed and cursed with a sharp memory.” I totally believe him after reading his Creating the Vietnam Veterans Memorial: The Inside Story (McFarland, 324 pp., $35, paper). Bob Doubek tells the story from his recollections and personal notes, calendars, photos, and news clippings, supplemented by material from the Vietnam Veterans Memorial Fund Collection archives, as well as public records including those from the Library of Congress. Consequently, the depth of his account appears limitless. After much controversy involving Maya Lin’s design, the Wall was dedicated in 1982. The book is a good read because Doubek, who was an important player in the Memorial’s early history, describes the fervor, as well as the pettiness and rancor ,displayed by those for and against the design, himself included. As executive director of the Vietnam Veterans Memorial Fund, Doubek was “in charge of building the Memorial,” he writes, “participated in every major decision and event.” Differences of opinion between him and co-VVMF founder Jan Scruggs, as well as with another early proponent of the Wall, Jack Wheeler, were practically a daily occurrence. All of the men were Vietnam War veterans; each had a highly personalized perspective of the Memorial’s purpose. The biggest problems during planning and building were finding sponsors, raising money, and determining the Memorial’s design. The earliest sponsor was Sen. John Warner of Virginia, who later played a crucial role in resolving many stalemates. H. Ross Perot also took an early interest in the project. The Memorial’s most important boost came from President Jimmy Carter when he signed into law a bill that provided a site on the Mall for the Wall in Washington, D.C. Money accumulated slowly but at an ever-increasing pace of public contributions. In the book’s longest chapter, “Our Opponents Take the Field,” Doubek objectively presents the opposition’s resistance to the design. James Webb and Thomas Carhart were the major voices against the design. They enlisted the support of Perot, who had changed sides. 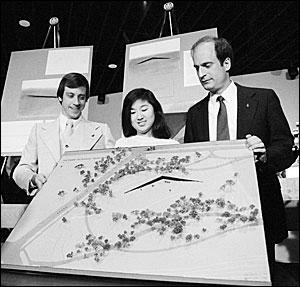 Targeted were Maya Lin and the jury that selected her plan for the Memorial during a nationwide contest. Opponents tried to discredit them with false accusations and prejudicial arguments. The media split on the topic. Doubek likens a face off between Lin and Perot to Bambi Meets Godzilla, but for once Bambi survived. Throughout the dispute, by the way, Vietnam Veterans of America endorsed the Memorial’s design. Doubek, Scruggs, and Wheeler stood together against the opposition. After the compromise of adding a statue and a flagpole to the site, groundbreaking proceeded as planned. Nevertheless, the design debate raged until the dedication ceremony. Even after the dedication, there were disagreements about where to place the statue and flagpole. One factor not discussed by Doubek is the tremendous psychological and spiritual impact the Memorial has exerted on Vietnam War veterans. In dozens of memoirs I have read, veterans cite visits to the Wall as turning points in their lives. In a somewhat magical way, the sight of the Wall and the visitors surrounding it gives many veterans a clearer understanding of the war and their involvement in it. To me, this effect above all else validates the construction of the Memorial.